Vientiane, the capital of Laos, and the final stop on my Thailand & Laos adventure. We arrived here late in the evening, after catching a flight from Luang Prabang (the roads were flooded, and we had to skip Vang Vieng). This actually meant we got an extra day here, due to our schedule change, which worked in my favour, as I was only going to have one day here originally, though other members of the group were going to end up staying for four or five days now. My initial perception of Vientiane was that it was going to be another large Asian city, not unlike Bangkok or Ho Chi Minh City. And in some ways it was; big, busy, lots of traffic, a little generic at times. But in other ways, I preferred it to some of those other places, as it wasn't quite as big, and it felt like there was a lot of character, especially in all the riverfront restaurants, and some of the sights we visited. It wasn't my favourite stop of the trip, but I did enjoy it more than I was perhaps expecting to. On that first evening, it was pretty late by the time we got to the hotel, but most of us still went out for dinner after we'd checked in. We were staying near the Nam Phou fountain, which is beautiful when lit up with coloured lights at night, and has several bars and restaurants nearby, and the one we went to was pretty cool, with colourful lanterns out the front, and a live band playing inside. Our first full day in the city was jam-packed with all the cultural sight-seeing, which the tour company (Intrepid) had organised to compensate having to change our tour route. First we met a local guide, who took us on a walking tour around the area we were staying in, which was near the river. We walked alongside the Mekong, looking across to Thailand on the other side. The waters were high and flowing fast, the same murky brown I've gotten used to seeing, but it was unusually high that day, and our tour leader said it's the highest she's ever seen it, because of all the rain and flooding recently (note to self: if I ever go back to Laos, do it in the dry season). We saw some locals fishing down by the banks too, and when we went for a closer look, one showed us what he'd been catching. I like these little encounters, when the locals are so friendly and inviting. We then went back into the town streets, walking around the back of the Presidential Palace (which I got a better view of from the front the next day). We stopped in to see Ho Phra Keo (or Haw Phra Kaew), a former temple which is now a museum, for religious art. We didn't go inside the actual building, but stopped off just to see its stunning architecture. It was originally built to house the Emerald Buddha, which it did for many years, until it was seized by Thailand, and now resides in the Grand Palace, in Bangkok (which I didn't get to see). 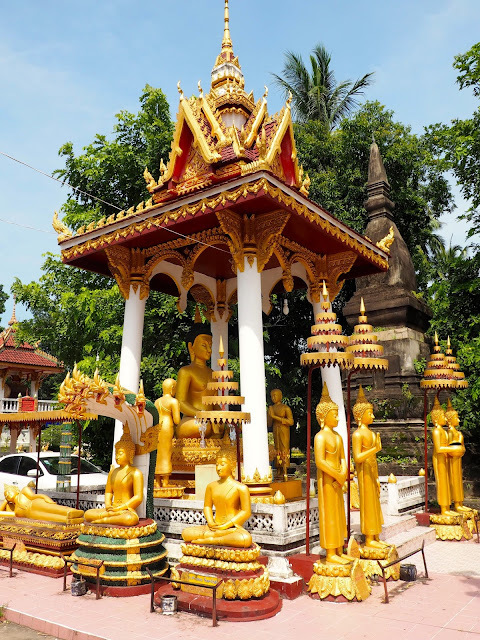 And then the last stop of our walking tour was Wat Sisaket. Yes, I've seen a lot of temples, both on this trip and throughout other parts of Asia, but we were taken to see this one in particular, because it is the oldest temple in Vientiane. The interior is undergoing restoration at the moment, but you could still go inside, and they even had signs explaining the work happening, which was much nicer than if they had closed it off. The main building is surrounded by a terraced courtyard, filled with dozens of Buddha figurines in various sizes; it's details like this that help me remember some temples better than others! Once our walking tour came to an end, we jumped in the bus and were taken on a drive about ten minutes through the city, to visit the Cope centre. This was one of the more unique stops of the whole trip, as it wasn't really about history or culture, and certainly wasn't as famous as likes of the elephant sanctuary or the Kuang Si waterfalls. This is a charity organisation, which offers aid to people who have lost or damaged limbs, by providing custom-made prosthetics and physiotherapy. We did get a history lesson here, but one about much more recent history; while most people know about the Vietnam war, many people have no idea about the effect it had on Laos, just across the border. In order to help the Royal Lao Government in their civil war against the communist Pathet Lao (which didn't work, as Pathet Lao won, and the country is still communist now), the US bombed Laos. Heavily. Laos is one of the most heavily bombed country per capita in the world, and the country is still full of unexploded ordnance. This was never reported on at the time, and is referred to as the "Secret War", but people are still affected by it today, as around 100 people per year are injured by unexploded bombs going off. The Cope centre provides much needed aid to these people, and we had a look around the visitor centre, and watched a video about local people being trained to remove the unexploded bombs, though the work is slow and will take many, many more years to complete. It's awful to see these horrible incidents that people have to deal with, but reassuring to see that there are people trying to help them, especially since many of the victims wouldn't be able to afford prosthetics on their own. After a break for lunch, we drove 25km out of the city, to visit Buddha Park. This is a sculpture park, full of religious statues, most of which look to be hundreds of years old, but actually the park was created in 1958, by a priest-shaman. 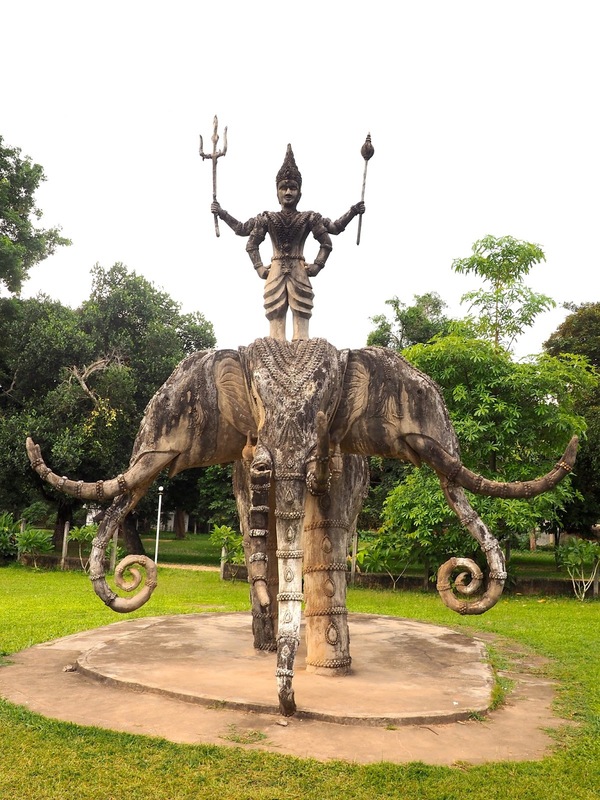 Although it is called Buddha Park, the priest-shaman integrated Buddhism and Hinduism, and the park contains statues from both religions, creating a very interesting and unique collection. I found it fascinating to wander through the statues, especially since I had been expecting a field of Buddhas, not unlike many of the temples we've visited, so it was amazing to explore such a diverse field of images, from the beautiful to the bizarre, all intricately and ornamentally designed. One of the most fun parts to explore was the giant spherical statue by the entrance, with a tree deign perched on top. You climb inside a huge mouth, then ascend the circular floors, peering through small windows into the central chamber full of yet more statues as you go, until you eventually emerge on the top, next to the tree, and are rewarded with a view over the whole park. It was a nice spot to just take in the view for a while, before we headed back down to explore the statues up close. That evening, once we returned to Vientiane, we had dinner at one of the riverfront restaurants, upstairs by the balcony. This also turned into a night of drinking and partying, since it was the last night when everyone would be there (my fault, since I was leaving late on the last night, and not using the last night in the hotel). The last day was a slow start for many of us, because of aforementioned partying. Since we had done all of the cultural touristy stuff the day before though, I didn't feel too bad about taking it easier, and just relaxing for the last day (especially since my travels were about to end, and I would have to face real work again). 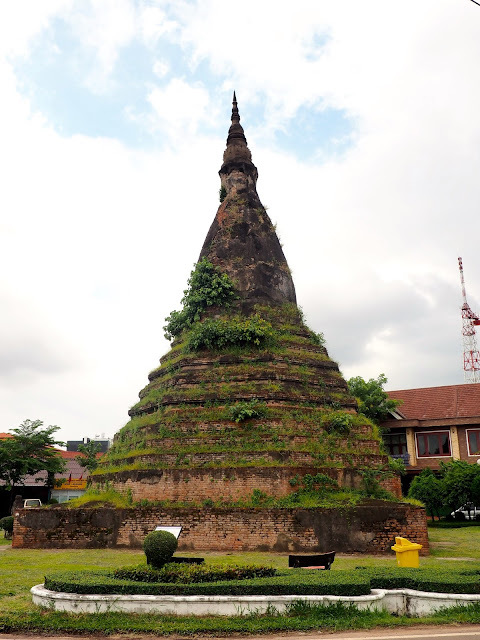 I did go out for a wander though, and found That Dum Stupa, also known as the Black Stupa. Its origin and age are unknown, but legend goes that it is inhabited by a Naga spirit, a 7 headed dragon, which protected the city's people when the Siamese invaded in 1827, and supposedly they stole all the gold from the exterior, leaving behind the dark, derelict looking structure that remains today. It's definitely one of the more unique stupas, lacking all the embellishments that most of the others have. 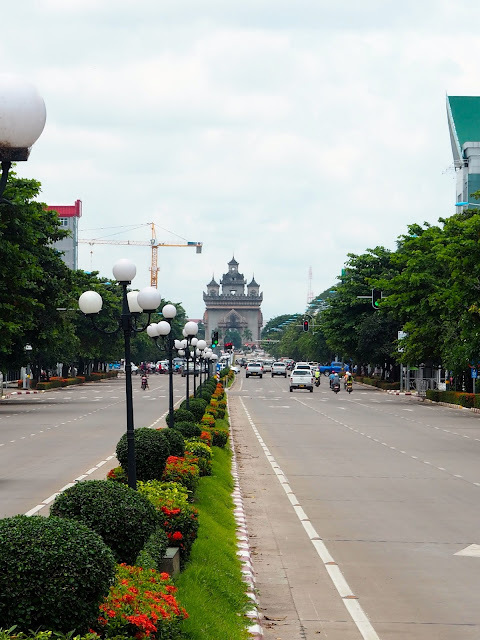 From there, I walked over to the main street, Avenue Lane Xang, from which you can see the Presidential Palace at one end, and the Patuxai, the large memorial arch in the middle of the street. The arch literally means "Victory Gate" and is very reminiscent of the Arc de Triomphe in Paris. Ironically, it commemorates those who fought for independence from France. My favourite story we heard about it, from the local guide, was that it was funded by an American donation, which was actually given to be used to build a new airport and runway, but the Royal Lao Government decided to build the arch instead. I only walked part way up the road to get a look at it, and then back the other way to see the palace. We met up with some of the group (who had been out on bikes that morning) for a late lunch, and found a place on TripAdvisor, which was ranked number one in Vientiane that day, and which I really liked. It was called Tyson's Kitchen, and we met Tyson himself, who runs it, and his father, who is the owner. His father was Chinese, who moved to Laos, and then Canada, and Tyson had chosen to come back to Laos to open a restaurant, which his father was kind enough to fund. It was so nice to come across a family business, and both of them were lovely people, who made the effort to come chat to us. The food was excellent too - mac and cheese balls when you are nursing a hangover are simply the best thing ever - and we were even given the tablet to control the music, since we were more or less the only people dat upstairs. I've had plenty of good food when travelling, but I'm so lazy about remembering the names of restaurants that I never really write about them, so when I do, I can be pretty sure that it was a good one. We then went for a slightly earlier dinner than usual, which was done to accomodate me having to leave for the airport later, and this was also a memorable one, in part because it was our last dinner all together, and also because of the restaurant itself. It was called Makphet restaurant, and it helps out the local community by taking on teenagers from poorer families and training them up in the kitchen, and there is a small shop inside, selling items made my local families, who will use the profits for the education of their children. It was a nice kind of place to spend our final evening, and a good way to feel like you're helping the community, and engaging in responsible tourism.